When you’re planning a vacation there’s so much to do to get ready to go. Obviously you have to book flights and accommodations and pack your clothes. Then there’s also getting yourself ready to go. I always chuckle when I think back to a trip to Arizona I took with my dad in the mid 90’s. I remember getting my bikini on in the bathroom of our hotel room and realizing there was no way I could ever go out in public. I had forgotten to shave and I’m not talking about just my legs here….everything! I remember using a disposable razor and hotel room soap and having the worst case of razor burn ever. Needless to say, I don’t leave home now without taking care of “business”. My advice is to add “hair removal” to your list of things to-do before you head out on a trip. Beauty expert, Rhonda Shupe, also has some insider tips on how to look and feel your best this Spring. 1. Choose a method that best suits your hair removal needs. If you are heading on a vacation, one concern people have is how to maintain soft and smooth skin. Rhonda suggests using wax strips because they are small, quick and easy to use. 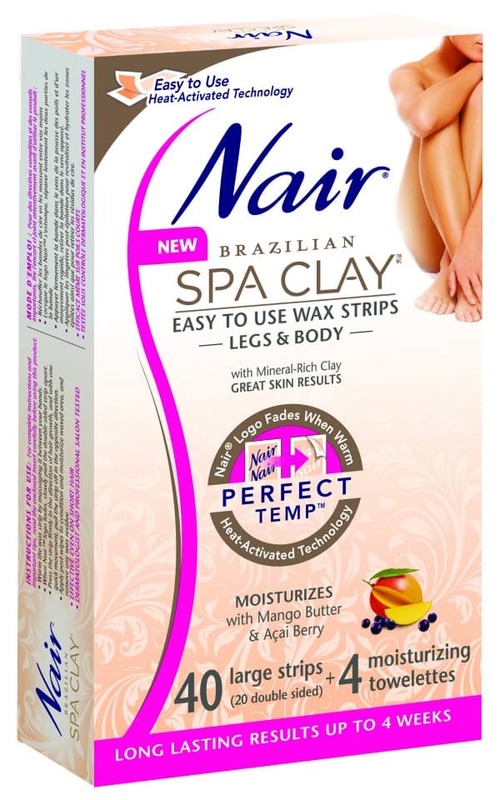 The Nair Brazilian Spa Clay Body Wax Strips will easily fit in your luggage and can be warmed through the friction of massaging the strip in your hands. If you are carrying on your luggage on the plane, I’m pretty sure that razors are a no-no anyways. The wax strips are a better bet. 2. Choose a method with added benefits especially for your face. 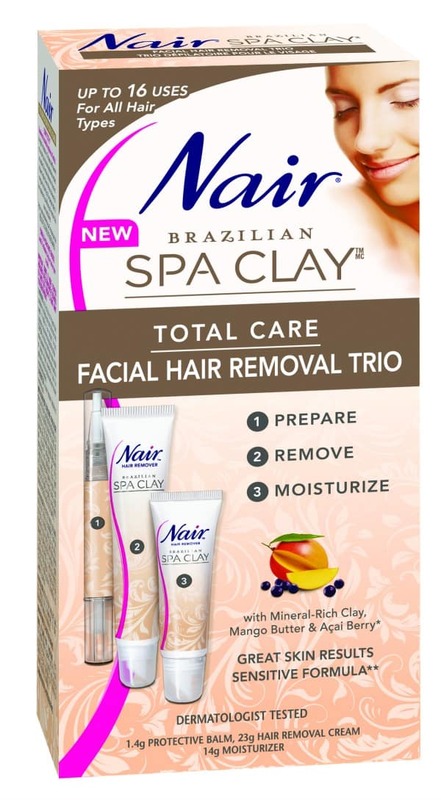 Rhonda recommends using a sensitive formula like Nair Brazilian Spa Clay Face Trio. It removes unwanted hair in minutes with a balm, cream and moisturizer and gives your face the perfect finish. Plus it provides antioxidant protection thanks to the inclusion of mango butter, acai berry and mineral-rich clay. 3. To lessen the pain of waxing, hold the skin taut. This helps to prevent muscle slackening and bruising. Rhonda says that the tighter you hold your skin, the less pain you’ll feel. I’ve tried it and she is right. 4. Relax. Easier said than done I know, but stress does magnify any discomfort you may feel. Pain is always worse for me when I’m stressed out or panicked about something. Rhonda suggests giving yourself some time to calm down. I recommend taking a few slow and deep breaths. Thankfully I don’t have to wax my face besides eyebrows and they barely grow anymore anyways. My legs on the other hand are a different story. The hair grows so fast and within a week of not shaving I look like a sasquatch. I love using the Nair Wax strips because I can give myself a salon quality wax without paying spa prices. You also never have to worry about burning yourself with hot wax. The wax strips are heat activated by the simple act of your hands rubbing the strip. When the Nair logo fades away, you are ready to wax. The moisturizing towelettes soothe the skin afterwards and leave my legs feeling soft and silky. It’s great to not have to shave them every day and saves me time in the shower. Though I’m not heading anywhere hot in the next few weeks, I do have a trip to Ontario planned. My legs will be ready for dresses and pyjama tops! Are you going on vacation this Spring? Connect with Nair Canada on Facebook. An embarrassing and painful way to learn to remember your unshaven legs. Not a good way to start the vacations. Sorry. Shaving, waxing…is not fun but necessary. I like the smoothness of waxing and really like that you can warm these in your hands. I have never been brave enough to try waxing, maybe this summer I will give it a try. Would love to find something that would last a bit longer than shaving. I have always used their products and trusted them. Waxing isnt real fun but its okay. Helps legs stay smoother longer. Thanks for the information. I’ve never tried this. We have a weekend getaway planned in July and a trip to Ohio in August. I love their wax, so handy and easy to use. With spring coming…time for some waxing!